Yesterday was time for another sketch over on Just Christmas and Birthdaycards. Linda has made a great sketch for us to play with. 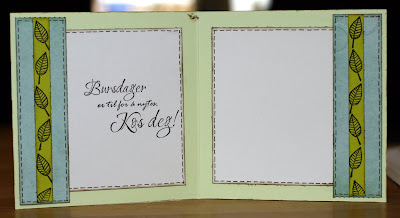 I decided to make another birthdaycard for a male. I am always short of cards for males, both boys and men. I realized that I have lots of cards for females, but not a single card for a male. So here I go. Here is Linda's fantastic sketch. Please join us with a birthdaycard or a christmascard, you have time until the 28th February. You have the chance of winning one of the fabulous new downloads from Tracy at the Creative Cottage Designs. The papers are a collection on pink and black accompanied with printable flowers, shoes and handbags. Now, please go and make a card for our challenge. We would love to see you join our challenge this week. I want to join A Spoon Full of Sugar's latest challenge which is Spring Time. 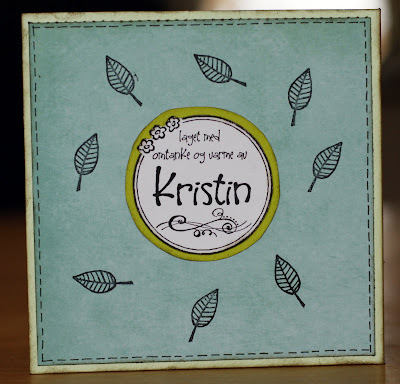 I think the colours I've used on my card is kind of springish, and the leaves I've stamped all over the card makes it a bit springish as well. Have a great day, and thanks for looking. Lenge siden jeg har besøkt bloggen din, må bli litt flinkere til det. What a stunning card, Angelo! 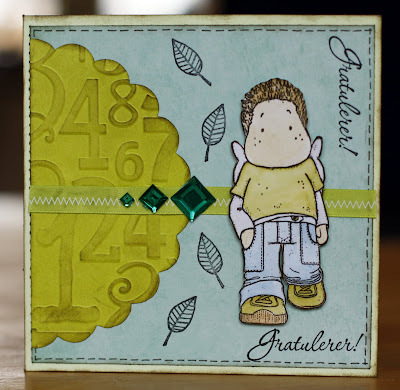 fabby "male" card ~ love the embossing with little edwin!! Oh your card is very gorgeous !!! Is very stunning flowers !!! very nice !!! thanks for your joining to A.S.F.A.S this week !! I love seeing how illustrators use their own set! And I love seeing such out of the ordinary ideas! It was nice going through it. Love this card!! I look at your work with amazement!! I can only wish to gain a small pinch of your talent!! Thank you so much for sharing your great ideas!